I want to speak directly to you moms out there. Moms who work full or part part time jobs, stay at home moms, moms who are facing intense trials with a child, moms who are walking on the mountain top rejoicing with their kids, moms of adult children or toddlers, moms who are tired, moms who are rejuvenated; those who are overwhelmed and those who are energetic. These next few minutes are for YOU. Do you know how important your role is? Do you know what a high calling you have placed on you?Do you know that your child looks to you for love, security and acceptance? Do you know that your words can determine the course of your child's day? That the look on your face every time you look at them plays an important role in their self worth? You are irreplaceable. You are valuable. You matter. God chose YOU to be the momma to the children you have, whether your children are from your own womb, foster care or adoption....you were chosen to nurture, love, teach, guide, challenge, grow, cheer on and lead your children! Stop for a second and name all of your children one by one. Say their names slowly and think about each one's giftings, the way they make you smile, the way they may make you cry, the things they struggle with, the things about them that make you giggle, the things that make each one of them unique. Abby. Morgan. Cole. Mackenzie. Gavin. Chloe. The names of the children that God gave me to mother. The names of the most precious people to me. I was never given the chance to be the earthly mother to our Chloe, but I carried her for 9 months, held her in my arms and continue to deeply deeply love her, even though she is in the arms of her Heavenly Father. Maybe you have your own "Chloe." If so, my heart weeps with you. But even her life was a gift. Each of my children are a gift from a God who loves me enough to entrust me with such greatness! What are the names of your gifts? You are a powerful force in your children's lives. Will you fail? Yes. Scream occasionally? Probably. Miss a soccer game or forget to send a sack lunch to school on sack lunch day? More than likely. Welcome to human-ness. I constantly see the words "mom fail" on social media from guilt ridden mommas when these minor situations happen. Those aren't mom fails. Those are natural, human moments that we all have. I have forgotten to pick my child up at preschool more times than I would care to admit. I have let my son wear his Spiderman mask in Wal Mart which in turn scared many little children. I've sent my kids to school with less than desirable hair on picture day, and sent Ramen noodles and Doritos in their lunches as their only source of nutrition. This speaks nothing of my parenting. And your mistakes speak nothing of your worth as a mommy either. Give yourself a break, you are human. Remember, you are your own worst critic. Lots of other mommas probably look at you with respect and think, "wow....shes such a great mom!" Don't downplay the importance of who you are in the lives of your children. Don't forget that your children are a gift. God could have chosen anyone else in this world to give them too, but He didn't. He chose you. With your yoga pants and ponytail or heels and a dress. With your professional job or your days at home cooking and cleaning. In the book of James we are told that every good and perfect gift is given from the Father above. Your kids are gifts, and you are a gift to them. Take time today to reflect on the good gift that they are. One of my favorite quotes is, "Your children will become who are you; so be who you want them to be." 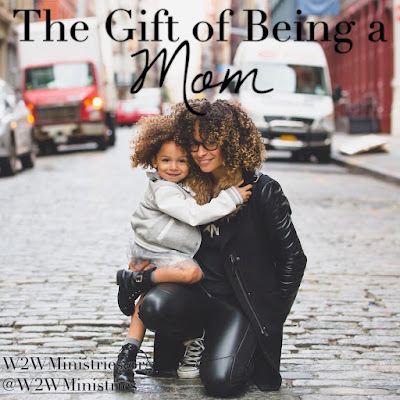 So moms, give yourself some grace. And don't be so busy that you miss out on the greatness of being a mommy. Because having someone call you mom, is a beautiful treasure; an invaluable gift.